While not many actually live to see 100 years those who actually do would see it as a great accomplishment. For Mrs. Mildred Elma Adams if she had to do it her way she would keep it simple. Today Aunty Elma, as she is well known, will be a centenarian and according to the well- spoken woman she would rather pass the day with her regular routine instead of a big celebration which is promised to her. ‘Aunty Elma’ was born on December 30, 1910 in Princes Street, Lodge where she grew up and later entered the teaching profession. That chapter of her life lasted for some 40 years. This newest centenarian who has been residing at the Medical Arts Hospital for the past five years now said she was married to a man, Joseph Jenico Adams who was ten years her senior. He died a few years ago. When asked what is her recipe for long life, with a bright smile ‘Aunty Elma’ replied “God”. “Without him I would have been dead I put him in everything I do and it is because of him I am here today.” Still with a great sense of humour, Aunt Elma said that maybe because she decided to drop her first name she is still alive today. She recalled as a child her family’s maid was named Mildred and she soon died. “After she died I refused to be called Mildred; no one in the house got me to answer to the name Mildred after that woman died, because I felt if I continued to use the name I would have died too,” Aunty Elma recalled. Ever since that death ‘Aunty Elma’ said she was called Elma. While there are plans for a big celebration for the centenarian, she said that she would rather just spend the day, as she would normally do. 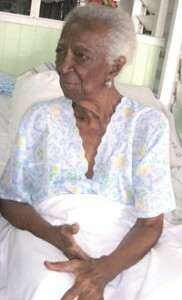 Now confined to her bed in the Medical Arts Hospital, a victim of arthritis, ‘Aunty Elma’ said her day begins at six in the morning with a word of prayer and reading her bible. At one hundred year-old ‘Aunty Elma is able to read her fine print Bible without the use of spectacles although she has a pair. She passes her days doing some sewing and reading. At her age too ‘Aunty Elma’ still has most of her faculties intact but recently she began experiencing problems with her hearing.